Eighty-eight minutes of sublime silliness...should appeal in equal measure to adults as to children. 88 min. Sony Pictures Animation. Cast: Hugh Grant, Salma Hayek, Jeremy Piven, Martin Freeman, Imelda Staunton, David Tennant, Anton Yelchin, Brendan Gleeson. Wallace & Gromit. Chicken Run. Arthur Christmas. In its consistent excellence, England's Aardman Animations might well be called EuroPixar if its U.S. distributor weren't Sony, and if clay didn't trump pixels at Aardman. Aardman's streak continues with The Pirates! Band of Misfits, eighty-eight minutes of sublime silliness. Though Pirates in the Caribbean has long since gotten long in the tooth, there's still some cachet left in the pirate trend. In fact, Aardman's latest film derives from a series of comic books by Gideon Defoe, who here adapts his own The Pirates! In an Adventure with Scientists. Since 'Mericans are stoopid, the film's title has been changed on these shores to The Pirates! Band of Misfits, but fear not: the story still ropes in smarty-pants historical and literary allusions. Due to its often sophisticated humor, The Pirates! Band of Misfits should appeal in equal measure to adults as to children. The madcap plot concerns the also-ran Pirate Captain (the inestimable Hugh Grant), who covets the "Pirate of the Year" award but stands little chance of winning it for his bumbling plundering (especially given the stiff competition from Salma Hayek's Cutlass Liz and Jeremy Piven's Black Bellamy). All bets are off when The Pirate Captain and his crew haplessly board the Beagle. Though they discover Darwin (David Tennant) has no booty, the naturalist recognizes the Pirate Captain's "parrot" Polly to be the last living dodo. And so our hero resets his sights on the Royal Society's "Scientist of the Year" award, but he'll have to contend with Darwin—here cast as an ambitious if pathetic villain ("I'll never get a girlfriend," he laments)—and the much-more-menacing Queen Victoria (Imelda Staunton), who avers to hate pirates (it's right there on her coat of arms, don't you know). The story doesn't skimp on the looting, cutlasses, plank-walking, shanties, and funny hats (not to mention the Pirate Captain's oft-noted "luxuriant beard"), but everything gets a winningly ironic spin. The pirates, for instance, look forward to nothing quite so much as "Ham Nite." One of the pirates is transparently a woman with a beard (Ashley Jensen's "Surprisingly Curvaceous Pirate"), Darwin has a monocled monkey servant named Mr. Bobo who communicates with cue cards, and at one point Jane Austen goes on a date with the Elephant Man. Of course, as directed by Aardman co-founder Peter Lord, the picture offers visual delights in old-school Claymation style, with an assist from some CGI effects (plus, pie-throwing in 3D). The production design comes courtesy of three-time Oscar-nominee Norman Garwood ("Brazil"), and the soundtrack includes the Pogues, the Clash, and Flight of the Conchords. Though the film is full of Anglophile easter eggs for adults (read quickly for a great gag, that's doubly paid off later in the film, about actor Brian Blessed), kids will appreciate the action, the goofy characters, and sentiments like this one: "It's only impossible if you stop to think about it." Sony goes for the gold with its Blu-ray 3D + Blu-ray + DVD combo pack of The Pirates! Band of Misfits, and proves once again that Sony sets the hi-def A/V standard. The Blu-ray 3D presentation is technically proficient, but as in theaters, the material doesn't have much of a 3D impact; it's fairly low-key in that regard. Given the negligible difference in price, most home-theater buffs will want to spring for the 3D if they have a system equipped for it, but others (especially those uncomfortable with 3D) won't be missing much by simply going for the excellent 2D Blu-ray transfer that's also included in the 3D combo pack. Both 2D and 3D transfers excel across the board in cleanliness, sharpness, and palpable textures: it's a rock-solid image, with color that's a bit subdued but by Aardman Animation design. The lossless DTS-HD Master Audio 5.1 soundtrack is a rollicking affair that likewise demonstrates technical proficiency and attention to detail in placement and crisp clarity; the mix is a bit front-centric, but dialogue is always plenty clear and effects and music remain robust. Accompanying the film is an optional audio commentary with director Peter Lord, co-director Jeff Newitt, and editor Justin Krish that gives considerable insight into the animation (and filmmaking) process; it's a film-school type of commentary rather than bonus entertainment, but animation buffs should be pleased. For kids, there's a Pirate Disguise Dress-Up Game (HD), but adults will want to hasten to the rest of the video-based extras, starting with the bonus short film "So You Want To Be a Pirate!" (18:07, HD) and the Peter Lord Short Films "Wat's Pig" (11:25, HD) and "War Story" (5:27, HD), both of which come with optional director's commentary. Two featurettes add to the picture of how the film was made: "From Stop to Motion" (20:52, HD) provides a concise overview of the steps along the way from concept and design through the animation builds and shoots and all the way to finishing touches like the score. "Creating the Bath Chase Sequence" (8:22, HD) delivers on its promise by honing in on a single sequence. 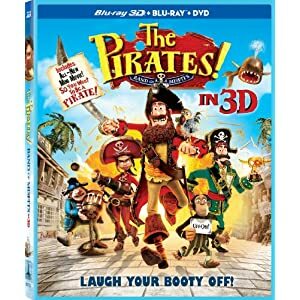 All in all, the 3D Blu-ray combo pack offers considerable value for fans of this animated, British-inflected pirate romp. All site content © 2000-2019 Peter Canavese. Page generated at 04/20/2019 06:15:27PM.